By attending the screening of "EASTERN BUSINESS", you will be able to participate in the Q&A session with the director, Igor Cobileanski and the main cast - Constantin Puscasu. Confronted with poverty and lack of perspective, Marian, the intellectual choir singer, and Petro, the sneak thief loser, form an unlikely friendship in jail, after a silly fight. They decide to become business partners and work on a plan to make money and reach their dreams: Marian - to finally marry his fiancée, and Petro - to buy a crane and earn from its rental. They manage to close a deal with three Caucasian gangsters and buy a wagon full of horseshoes, but they soon get robbed and everything seems to be turning to dust. Even if they are constantly followed by bad luck, the two men don't lose their optimism and always try different things to earn their money. 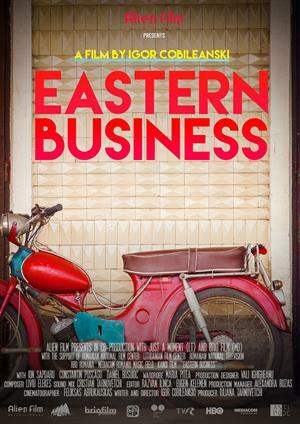 Eastern Business is a dark comedy about how absurd and sarcastic sometimes life proves to be.